You can feel it in the air and see it on the airwaves, a hurricane is brewing. And I’m not talking about the weather. This year’s election will turn the tide for working families, one way or the other, and if we want to make sure that “wages are too high” Donald Trump isn’t steering the ship, we must take action. With so much at stake, it is more important than ever that we are prepared to weather the storm. Florida’s Labor Unions and community organizations have made great strides in unifying around shared values, like; raising wages, paid sick days, wage recovery ordinances and a strong public education system. Labor and community organizations are working side by side to engage voters in Union Halls, places of worship and in their own neighborhoods urging each of them to be prepared. Unlike a real hurricane, it doesn’t cost anything and is as simple as educating your family members on the issues and making sure each of them votes. We all know that friend who feels like their vote won’t count or that younger sibling who thinks if they don’t vote, it wont make a difference. It is our responsibility as community leaders and family members to prepare and assure them that every vote counts. How do we do this? 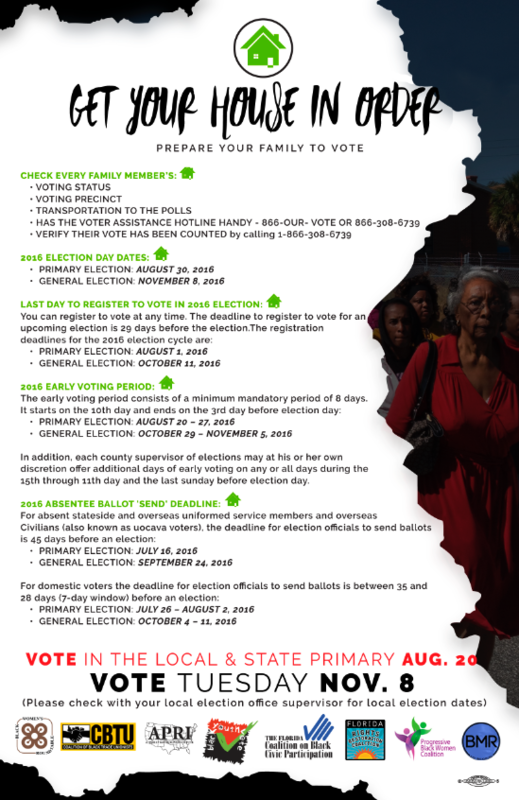 Follow the simple Elections Voter Survival guide below and click on the links to get organized and get out the vote! Check each family members’ VOTING STATUS – Register any unregistered family members, check existing voter registrations and update if necessary. Click here to go to your local Supervisor of Elections. CHECK THE VOTER ID REQUIREMENT – make sure each family member have sufficient identification to vote. MAKE SURE EVERY FAMILY MEMBER HAS THE VOTER ASSISTANCE HOTLINE HANDY (888) OUR-VOTE OR (888)308-673 – this number helps voters who are not allowed to vote for any reason. MAKE SURE EVERYONE HAS TRANSPORTATION TO THE POLLS or better yet, register to VOTE BY MAIL and vote where and when you choose. Don’t forget to sign it and mail it back before the deadline. *In addition, each county Supervisor of Elections may offer additional days of early voting on any or all days during the 15th through 11th day and the last Sunday before Election Day. Click the image below for a printable version of the survival guide by our sisters and brothers of APRI and CBTU.